Summer parties should be as easy and breezy as the weather. What you really need are a few summer party recipes that can help you keep your guests happy. There is nothing like a dip on a hot summer day. By a dip I, of course, mean guacamole. Guacamole is a refreshing blend of avocados, onions, jalapenos and cilantro. This recipe serves 2-4 people. Cut the avocados in half and remove the seeds. Scoop the avocado out of the skin using a spoon. Mash the avocado in a bowl. 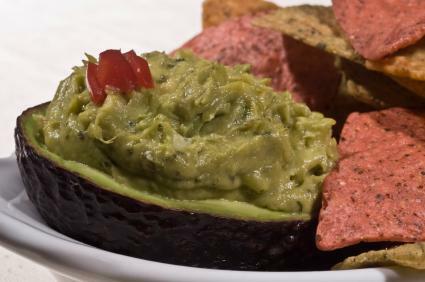 For a chunkier guacamole save one half of an avocado, cut into small cubes and mix it in last. Add the onion, tomato and lemon juice. Add part of the chopped jalapeno and taste for heat. You may not need to add the whole pepper. Taste for salt and pepper and add some if needed. Appetizers set the tone of a party just as much as decorations and music. These flavorful bites are festive and add a fabulous touch to your party. This recipe serves 6. Season the lamb medallions on both sides with salt and pepper. Brown on one side for 2 minutes in your broiler. Remove the lamb from your broiler, turn over and spread with the mustard. Sprinkle the lamb medallions with the brown sugar. Return the lamb to the broiler. Continue to cook the lamb for another 2-3 minutes. Remove the lamb to a plate and let cool for 5 minutes before serving. This is a spectacular dessert. Not only is this one of many easy, cool and refreshing summer party recipes but it also looks amazing and is sure to be the talk of the party. These oranges can even be used as party decorations. This recipe serves 8. Place the sugar, half the lemon juice and ½ cup of water into a medium saucepan. Cook over a low heat, stirring occasionally, until the sugar is completely dissolved. Once the sugar has completely dissolved increase the heat to medium and bring the liquid to a boil. Let the mixture boil for 2-3 minutes until the solution is clear and slightly thick. Remove the pan from the heat and let the syrup cool. Slice the tops off of eight of the oranges. Save the tops, they will become the hats for the dessert. Using a spoon carefully scoop out the insides of the oranges. Place the orange shells and hats on a cookie sheet and place the cookie sheet into your freezer. Grate the zest off the remaining oranges and add the zest to the syrup. Squeeze the juice from the remaining oranges and from the scooped out flesh and add the juice to the syrup. You need about three cups of juice. Mix in the rest of the lemon juice and taste the syrup. Add more sugar or lemon juice if needed. Pour the syrup into a shallow container. Plastic or Pyrex work best. Place the container into your freezer and let it freeze for 3 hours. Take the container out of your freezer and use a fork to break up the ice so that it is has a course texture. Put the orange ice back in the freezer for 4 more hours until the ice is firm but not solid. Pack the orange ice into the frozen orange shells. Set the hats on top. Place back in the freezer until you are ready to serve dessert. If the oranges tend to tip over place a towel on the cookie sheet to help keep the oranges upright. Just before serving push one bay leaf into the center of each hat. With recipes like these, your summer parties will never be boring. Remember, you can double these recipes as needed to make sure there's plenty to go around for all of your guests.